"This pork shoulder recipe combines pork shoulder with apple cider in a slow cooker, where it is cooked for several hours until tender. 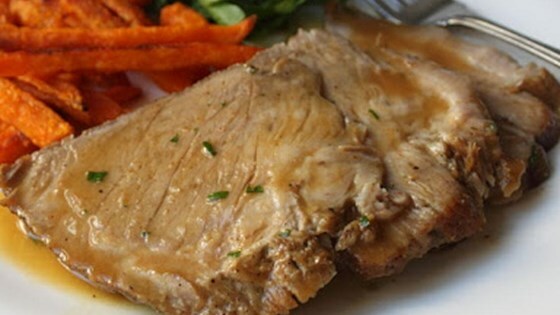 Reduce the cooking liquid to create a thick and flavorful sauce you can pour over the sliced pork." Disappointed in this recipe. No alterations ..... aroma and outcome were incongruent. Bland. The blend of flavors was excellent, with just a hint of sweet! It's easy to prepare smell awesone good while cooking..simple comfort food. Very good and could not be easier! I'm not a fan of pork shoulder, so I used a center cut pork roast instead and just reduced the cooking time to make sure it wasn't too dry. Very good!